Summer is here! Both Emma and Chloé are on holiday now. My days change significantly when they are in the house each day. Not that they are difficult at their age but I find my brain is more easily distracted when others are here. Plus for sure, there are occasional interruptions and taxi duties. And more sharing is required of computers, etc. Now it is the cranky, middle-aged mother, not toddlers, having difficulty with sharing. Good news! I am slowly but surely getting used to my new computer setup and starting to produce prints from it. 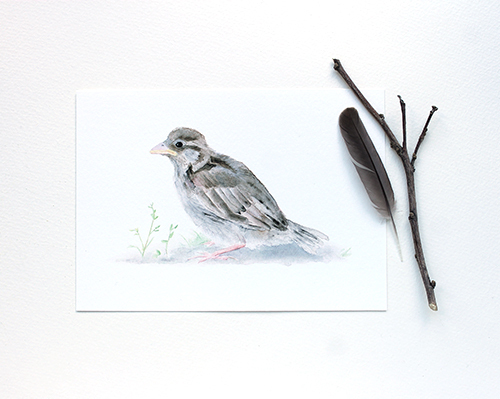 So proud of this little baby sparrow print. I just added it to my shop today. I'll also be adding him in a larger 8 x 10 format. I have other prints ready to go into my shop and a pile more paintings to convert. It's slow work but worth it to me to do it right. Plus Emma, who is a Photoshop whiz, has been helping me a lot. After having one of the best months ever sale-wise in May, June has been so, so quiet. I was worrying about it and then realized that it was actually a good thing as my computer situation would have made it very hard to keep up had it been busier. A good lesson in accepting and adapting to circumstances. Here's another addition to my shop this week. And a cautionary tale. 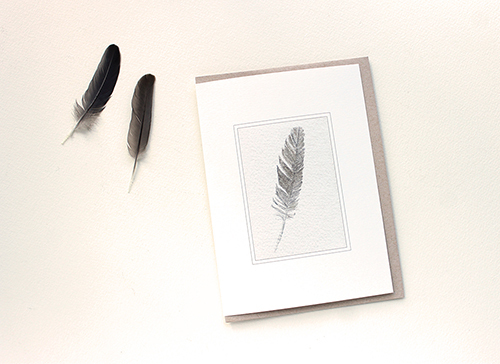 I was so elated when I finally figured out the feather card that I immediately sent a message to the customer who had made the enquiry. And then I quickly sent an email to an artist friend with whom I share lots of the ups and downs of my art making and print making. I pressed send and then looked at my screen. To my horror, I had sent the second email (the one destined for my friend) to the customer as well. In the email I had referred to the 'stupid...I mean sweet sparrow feather', all within the context of the hours of work it had taken to finally get it right. A friend would understand. A customer? I'm not so sure. When I realized what I had done, I immediately sent a note of apology to the customer but I think the damage was done. I haven't heard back from her. I still feel awful and so embarrassed about it. From me to you: Be careful with that 'send' button. Oh, well...it happens. your customer may still return. Both the sparrow & the feather are great! May was good for my shop, too. I was surprised! Thanks, Carol, for the supportive words. Your feather card looks lovely. Funny how these things work with our computers, persistence eventually delivers! Well done.I understand your frustration with the 'send' button mix up, but like Carol said you never know maybe she will still return. Thank you, Annamaria! I appreciate your support and friendship so much! Glad you managed to work things out for the feather card, it looks super lovely !! And June ... ah yes, we're in the same boat ... after April & May being awesome, well June .... no comment. Maybe the customer will truly understand and hasn't been online since you sent it! Most people are nice if given a chance, I think. I hope. LOL Love both pieces though. Dear Kathleen - this sparrow and feather are beautiful...computers and all the stuff it takes to accomplish just what you did amazes me! I think like Crimson leaves maybe your customer just hasn't read her email yet. Take care and have a great day.